What are your plans for this Saturday evening, 9/21/13? 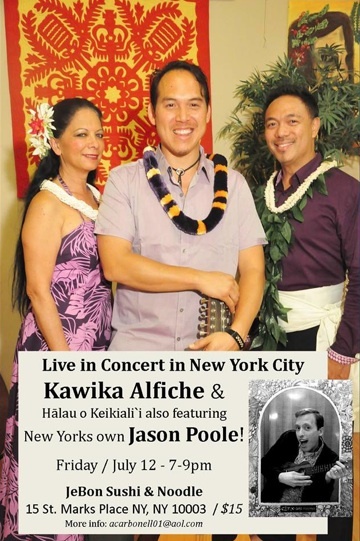 If youʻre in NYC, I hope you’ll come to my show! 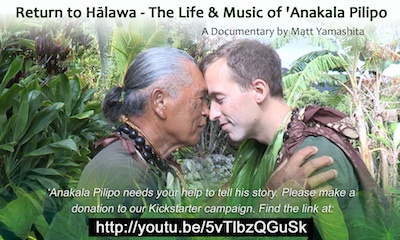 It’s a fundraiser concert/musical talk-story that is being done to help raise money for an upcoming documentary I’ve been telling you about: RETURN TO HĀLAWA-The Life and Music of ‘Anakala Pilipo. It’s the story of my teacher (aka Pops) and his legacy. And my own story is woven throughout the film, as well! I’ll be sharing lots of Hawaiian songs and stories of my (mis)adventures on my travels–especially about my time on Molokai down in Hālawa Valley. I can’t wait to share this Aloha-filled evening with you. I hope to see you there! Our friends at Hālāwai have added it to the Community Calendar. Please click HERE to see all of the details. RSVP: to Eleanor Eleia2000(at)gmail(dot)com to ensure a reservation on the guest list. Seating is limited–the venue can accommodate up to 100 people with seats for 75. You guys: Tomorrow night in NYC is gonna be magical! Kumu Kawika Alfiche and members of Hālau o Keikialiʻi are HERE IN NYC. We had a great rehearsal today. ʻOno tunes and awesome dancing. So here’s my question: ARE YOU GONNA BE THERE? * Please check out Hālau o Keikialiʻi’s website by clicking HERE.